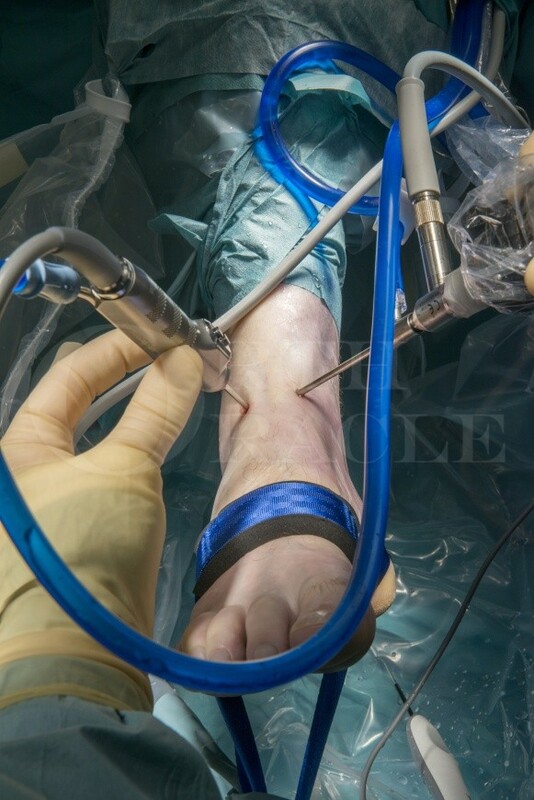 Learn the Ankle arthroscopy using the Smith & Nephew Guhl non-invasive ankle distractor surgical technique with step by step instructions on OrthOracle. Our e-learning platform contains high resolution images and a certified CME of the Ankle arthroscopy using the Smith & Nephew Guhl non-invasive ankle distractor surgical procedure. Modern ankle arthroscopy was popularised by amongst others James Guhl in the United States in the eighties and is now a common place intervention in most Foot and Ankle surgeons repertoires. Many of the pathologies which cause symptoms in the ankle are soft tissue in origin and poorly imaged by MRI. A normal scan should definitely not be a reason not to intervene in a joint that has failed to recover and which has well localised and congruent symptoms. Ankle arthroscopy has a significant role in the treatment of the post traumatic joint (after fracture or severe sprain) as well as early ankle arthritis from any cause. There are a variety of portals described for ankle arthroscopy but the vast majority of pathology in almost every intra-articular location in my experience can be dealt with through the basic antero-lateral and antero-medial portals described in this technique. The keys are having appropriate portal placement and a wide enough range of appropriately sized (and angled) instruments. Posterior ankle arthroscopy is a different beast for different indications and demonstrated by Nick Cullen from Stanmore elsewhere in OrthOracle. A comprehensive review of the range of other portals is to be found in the paper by Ferkel & Scranton (Current concepts review:Arthroscopy of the Foot & Ankle. J Bone Joint Surg.1993. 75-A:1233-1242. R.D.Ferkel , P.E.Scranton) or any of James Guhls instructional works. Instantaneous recovery never occurs after an ankle arthroscopy despite instantaneous removal of the causative pathologies. The joint linings need to heal just as any operated soft tissues and this may take 6-12 weeks, condition dependent. Full recovery after microfracture of osteochondral defects is longer again in most cases by another couple of months. The set up and detailed technique described here is basically the one taught to me by Paul Cooke during my fellowship in Oxford fifteen years ago. My guess is he worked most of the tricks out himself, but it may just originate from elsewhere.